Can you tell us a little about Merus Audio? Merus Audio is a young audio semiconductor company, founded and based in Copenhagen, Denmark. We develop audio amplifiers that are fully integrated in a single chip. We focus on making the world’s most energy-efficient and compact amplifier solutions. On top of that, our amplifiers are extremely well-performing when it comes to audio quality. Your multi-level eximo® amplifier is widely known for its efficiency. Can you tell us about eximo®, explain the technologies behind this amplifier’s success, and what audio solutions it is perfect for? The eximo® multi-level amplifier technology is the only of its kind in the market. A multi-level amplifier uses more, but smaller, transistors for delivering power to the speaker. This way, switching activity and power losses can be reduced significantly and more power is delivered to the speaker. Multi-level power conversion is not a new invention. It has been used in high-power inverters and motor drivers. Merus Audio has applied and refined the technology for audio amplification and combined it with an advanced power management system to minimize power losses under all conditions. 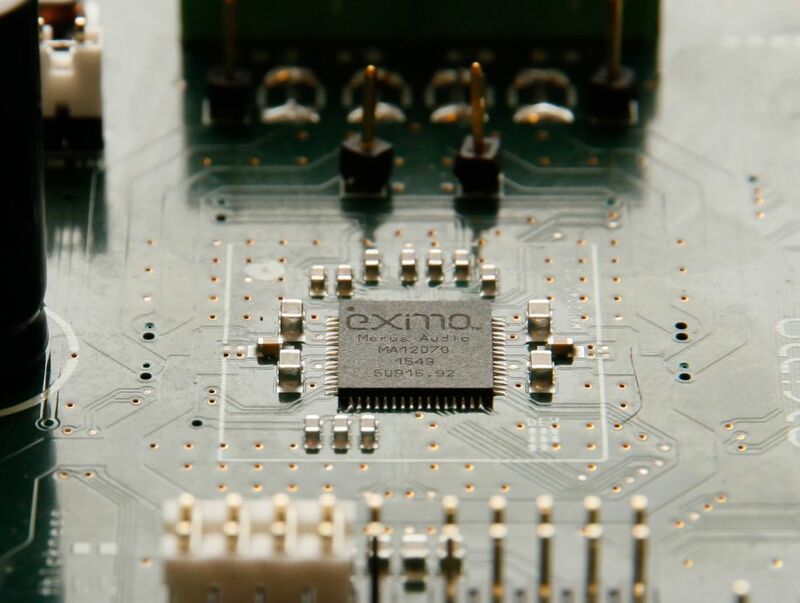 eximo® amplifiers are widely applicable across audio applications, simply because low power loss is a key advantage in almost all audio products. This is obvious in battery-powered applications where battery life can be extended considerably by using our amplifiers. Similar goes for PoE audio products as one wants to make the most of the limited available power. But also mains-powered audio products such as soundbars or multiroom speakers benefit from lower heat dissipation. You mentioned that eximo® is compact. Please explain the benefits of having these technologies in such a tight package for other companies out there looking for high performance and ultra-low distortion levels to integrate into and power their audio solutions. Multi-level eximo® amplifier solutions are primarily compact because they don’t require large filter components to filter the amplifier output signal before it reaches the speaker. These filters are typically used with competing solutions and they add significantly to solution size as well as the Bill-of-Material. A small solution size is critical in most audio products today, due to significant space constraints in the end product. Who are you targeting with eximo®? Is it a direct to consumer product or sold through professional AV integrators? We target manufacturers of consumer audio products. In other words, if you are a maker of portable or wireless speakers, soundbars, multi-room audio systems, TVs, stereos, or similar, our amplifiers will be applicable in your product. You also mentioned quite a number of audio solutions. Why is eximo® appropriate for such a wide variety? Simply because high energy-efficiency, small solution size and high audio quality are in high demand in virtually all consumer audio applications. And these are exactly the qualities that we promote in our amplifiers. What is your take on the Home Audio market? Do you see a growing demand for high quality audio products or convenience based audio such as Bluetooth speakers and Amazon Echo’s? Wireless connectivity and the convenience of portability have been key drivers in the audio market over the recent years. These solutions are now present everywhere. The next big wave will surely be driven by voice control and home automation technologies, found in speakers like Amazon Echo or Google Home. However, we now also see that more consumers again turn their attention to audio quality, but without wanting to sacrifice on convenience. So, it’s really not a matter of choosing audio quality over convenience, or vice versa. Manufacturers who can combine portability and wireless connectivity with great sound are positioned to win in the market. And we believe our amplifiers have an excellent fit for exactly that challenge. What is on the horizon for Merus Audio? Our first amplifier chips only hit the market recently and they are gaining tremendous interest. You will find our amps in a range of cool audio products already coming out this year. Next to promoting our current amplifiers we are already working full speed on several new amplifier chips in our pipeline. They will be another big leap forward in terms of efficiency, size and audio performance. Also, we will be bringing product to applications such as smartphones, tablets and notebook PCs. So, there’s a lot to look forward to!